Vijaya House collected a total of 539 points and bagged the overall athletic championship trophy at the Annual Inter-House Sports meet organized by the sports unit of Wadduwa Central College held at the College playground recently. 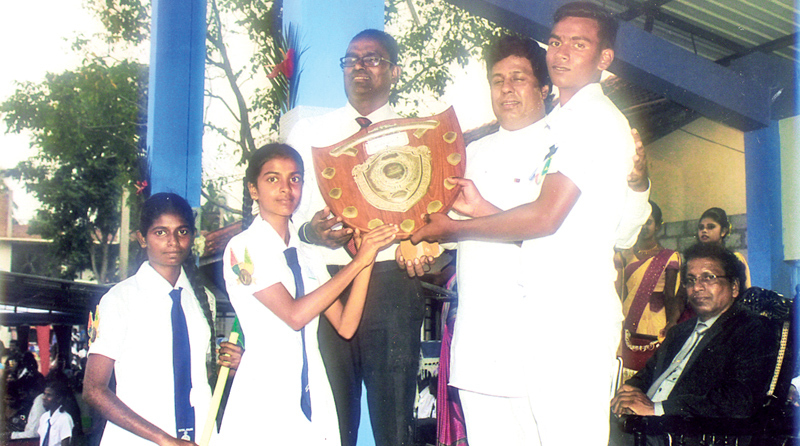 Tissa House with 385 points won the runner up trophy Gemunu House 378 points and Parakrama House with 329 points were placed third and fourth respectively. The chief guest at the event was reputed South Asian Athletic Gold medials and Athletic Champion Mrs. Jayamini Illepurma. Trophies medal, Certificates and prizes for winners were distributed by the guest of Honour, a reputed old boy of Wadduwa Central College and Kalutara District Parliamentarian Jayantha Samaraweera with the participation of Principal S.D.N. Gunarathna. Ten championship cups were also awarded to 10 most outstanding athletics by the principal at the awards ceremony. They were under 12 most outstanding boy Athlete M.D. Pubudu Oshada Mendis (Thissa House) girl. P. Maleesha Sasindi Thisera (Tissa House). Under 18 best boys athlete M.W. Kithmina Sahan (Vijaya) under 18 Best girls athlete. L. Surandi Sangeethika (Prakrama). Under 20 best girls athlete . Ishini Sewwandi (Tissa).